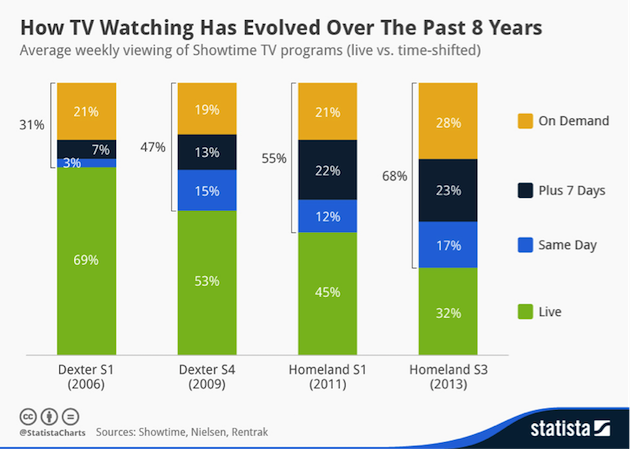 Television viewing habits have changed dramatically over the past decade. The exhibit below highlights this trend quite clearly, where the wave of online and on demand content now forces satellite operators to question the long-term sustainability of the linear TV business that has been traditionally their “bread & butter”. In almost the same time frame, OTT subscribers have grown double-digits year-on-year to a point where certain video content today skips linear TV altogether and opts only for the online channel. So video is on its way to reaching “everywhere” even if it is not quite there yet, and it seems that satellite operators are approaching the inevitable OTT rise in two distinct ways. As HughesNet and Exede have demonstrated with 1.5+ Million subscribers in North America, it is possible to run a sustainable business using a closed HTS satellite model. The same model may have yet to fully prove itself in Latin America, Middle East & Africa or Asia, and NSR’s VSAT and Broadband Satellite Markets, 13th Edition report projects that more than half of broadband subscribers will continue to be from North America even towards the end of the decade, per the exhibit below. Add to this the fact that MEA and Asian regions have a sizeable chunk of SME subscribers in their relatively small satellite numbers, and one can reasonably conclude that the play for satellite-based OTT outside North America is currently a small demand driver that warrants limited attention. On the other hand, both HughesNet and Exede websites list viewing of OTT content as a deciding factorin selecting their data plans. 7 hours of Netflix a month in HD is all that a 20GB pack can get you, which seems hardly enough for a Game of Thrones marathon. Not to mention, the highest tier may end up costing users as much as $130 per month although currently promoted with 50GB bonus bytes at a “possible lower speed”. Suddenly cord cutting doesn’t seem all that attractive to those on satellite broadband. Nonetheless, becoming a regional ISP is a route that satellite operators have taken on the back of spot beams & frequency re-use. As GEO HTS, and indeed LEO HTS adds more capacity, this may well be a more “traditional way” for satellite operators to deliver OTT. Eutelsat’s “SmartLNB” solution that tied in Broadpeak from a Content Delivery Network perspective, has resulted in a satellite OTT solution independent of terrestrial infrastructure. Intelsat, Korea Telecom, SatLink and others have also added OTT to their list of services offered although details remain sketchy on whether these are truly OTT plays or simply a broadcast offering tweaked to allow a few interactive services. Nonetheless, video over IP is now an offering for which erstwhile broadcast-only satellite providers see growth potential. As traditional DTH and cable operators try to combat cord cutting, satellite operators are trying to provide an “OTT flavor” by bolting these solutions to broadcasting. NSR’s Linear TV over Satellite, 8th Edition report looks at these markets in more detail. No matter which route satellite operators adopt, they cannot ignore that viewers today are consuming more video content over terrestrial telecom networks than ever before. In addition, this consumption is growing at a much faster rate as compared to linear television over satellite channels. As advertisers, premium content and innovative business models get drawn to OTT, satellite operators risk missing the boat if they do not adopt either an ISP or a complementary OTT play. While cord cutting may be a few years from being a major threat, the mushrooming viewership figures of Netflix and Hulu are real today. And satellite broadband has a long way to go—perhaps using LEO—to become attractive to true cord cutters.